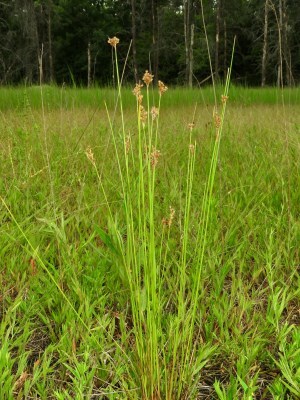 Juncus interior Wiegand is has similar auricles to J. dichotomus and may well occur in Michigan, although no material has been located (despite reports from the state). It differs in having the perianth appressed-ascending rather than ± spreading and the bracteoles acuminate rather than blunt or merely acute. See Catling & Spicer (1987) for more details. It is more easily distinguished from from J. tenuis in having short, hardly prolonged auricles, and from J. dudleyi in having them thin-margined. MICHIGAN FLORA ONLINE. A. A. Reznicek, E. G. Voss, & B. S. Walters. February 2011. University of Michigan. Web. 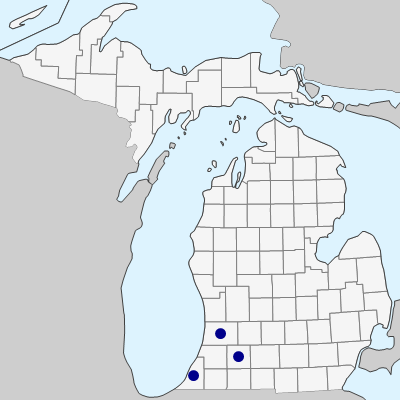 April 21, 2019. https://michiganflora.net/species.aspx?id=2914.